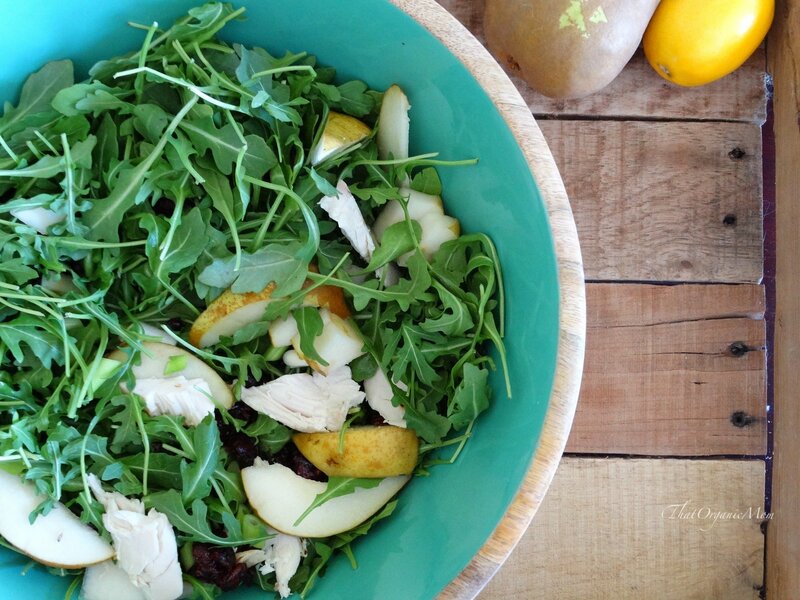 The combo of pear and arugula just makes my mouth water! I started eating this salad back when I was a raw vegan, but since I started eating meat again I added in chicken. Voila! 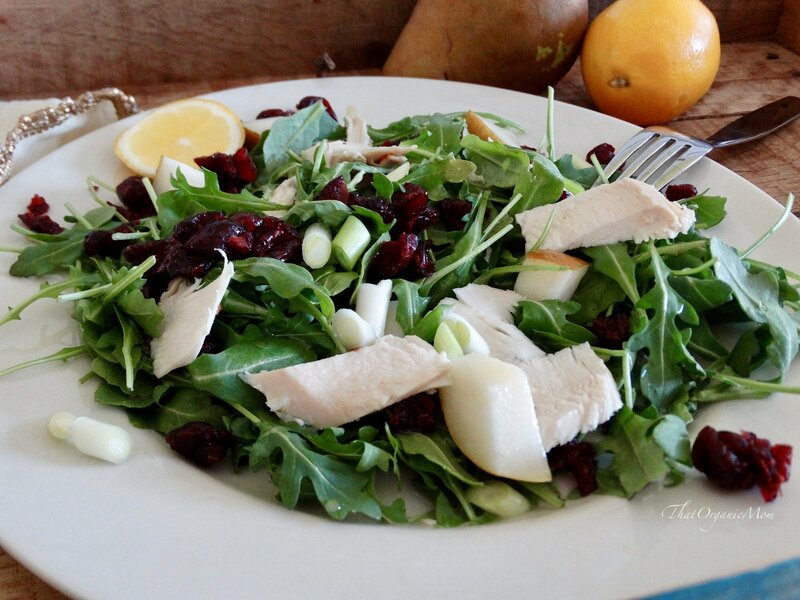 Chicken and Pear Arugula Salad with Meyer Lemon Vinaigrette. The flavors of this dish combine so deliciously. If you can't get your hands on Meyer lemons, you can use a combination of lemons and mandarin oranges to get a similar taste. 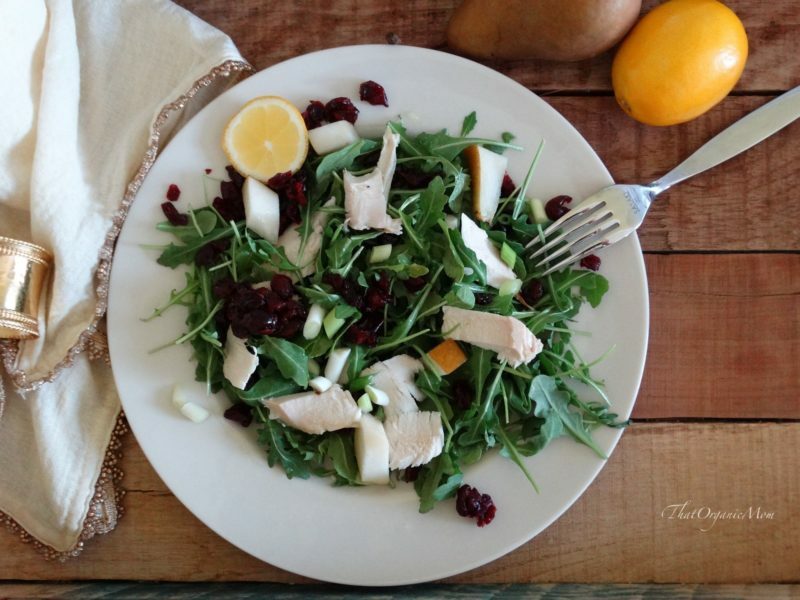 The peppery taste of arugula pairs so well with the sweetness of the cranberries and Meyer lemons just top it all! Meyer lemons are everything I love about citrus fruits all rolled into one bundle of sunshine! For years I have been a huge fan of lemons. When we lived in Florida, I had a few citrus trees, oh how I miss them, and Florida! Meyer lemons are like a combination of lemons and oranges, tart but not as tart as regular lemons. The peak season for Meyer lemons starts in November and runs through March. Meyer lemons are often described as a cross between a lemon and a mandarin orange. I have found them in various supermarkets such as Trader Joes, Fresh Market, Whole Foods and Earth Fare. 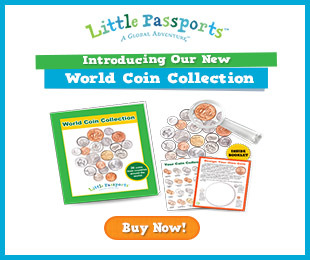 I hope you can get your hands on some! Can I just say that if you are making your own salads already you are doing great! 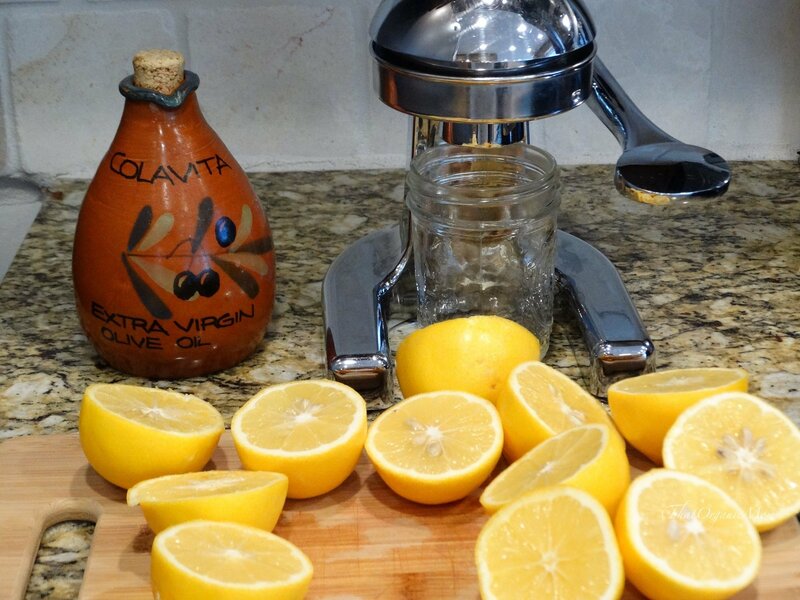 Let me challenge you to venture into making your own salad dressing! Vinaigrettes are a type of dressing that are incredibly easy to put together. Try using a salad dressing measuring mixing bottle if you are unsure or a beginner. Choosing the right dressing for your salad can be the difference between a “meh” salad and a “wow” salad. So start experimenting with your own flavors and creations! To make this salad, you can always use precooked chicken. Each week I cook two chickens to use throughout the week, so that's what I use. Build salad in a family size bowl. Mix dressing in a separate container, mix well. If you have any leftovers pack them into a quart jar for a nice lunch for the next day. The kids love this salad and I let them put extra cranberries in their bowls. They also like to use a squeeze bottle to drizzle the dressing on. Remember, if you can't get Meyer Lemons you can still make this salad, just use three lemons and one orange. If you really like pecans, they also taste delicious in this salad. I hope you'll try making my Chicken and Pear Salad with Meyer Lemon Vinaigrette and let me know how you like it! And hey, pin the image below to your “eating healthy” board on Pinterest! 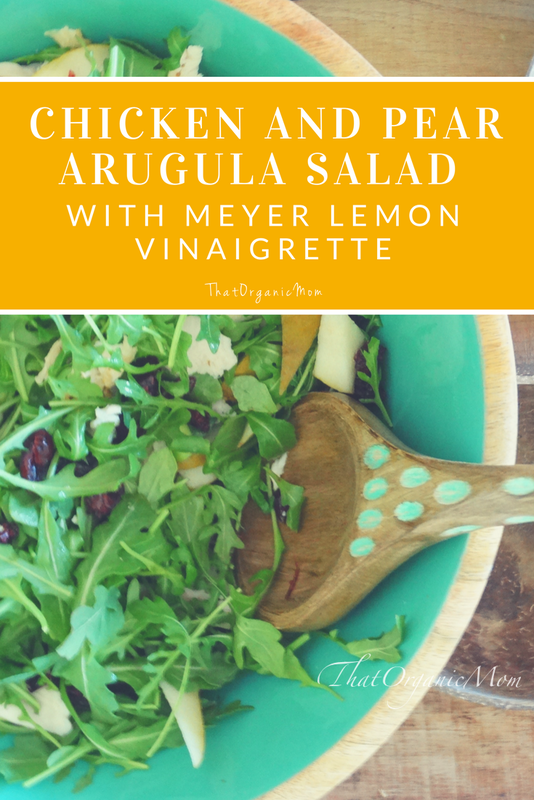 Help get the world eating arugula and Meyer Lemons, pin this post!